Kiriko, LLC. is voluntarily recalling all lots of A1 Slim 30 capsules bottle to the consumer level. 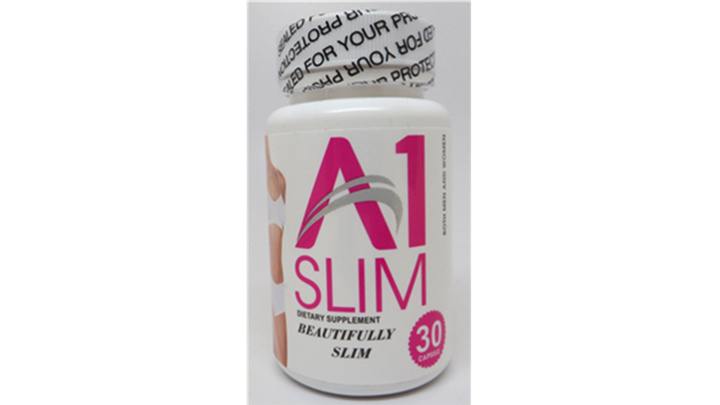 FDA laboratory analysis has found the A1 Slim product to be tainted with sibutramine, phenolphthalein and N-Desmethyl sibutramine. These undeclared ingredients make this product an unapproved new drug for which safety and efficacy have not been established; therefore, subject to recall. Sibutramine is an appetite suppressant that was withdrawn from the U.S. market in October 2010 due to safety concerns. N-Desmethyl sibutramine is an active metabolite of sibutramine. Sibutramine and its active metabolites substantially increase blood pressure and/or pulse rate in some patients and may present a significant risk for patients with a history of coronary artery disease, congestive heart failure, arrhythmias or stroke. Phenolphthalein was previously used in over-the-counter laxatives, but because of concerns of carcinogenicity, it is no longer marketed in the U.S. To date, Kiriko, LLC. has not received any reports of adverse events related to this recall. This tainted product is marketed as a weight loss dietary supplement and is packaged in a white plastic bottle containing 30 capsules with a white screw-on cap, barcode A105212014. The recall includes all lots of A1 Slim remaining within expiry. The product was distributed Nationwide via retail stores in Houston, TX and by mail-order (December 6, 2016-May 1, 2017). A1 Slim is notifying its distributors and customers by telephone and mail and is arranging for return of all recalled products. Consumers and retailers that have A1 Slim which is being recalled should stop using and return the product to the place of purchase. Consumers with questions regarding this recall can contact Kiriko, LLC. by phone at 832-228-3613 or e-mail at kirikosolution@gmail.com on Monday-Friday, 8:00 AM to 4:30 PM, CST. Consumers should contact their physician or healthcare provider if they have experienced any problems that may be related to taking or using this drug product.